The cabins range from a cosy two-person studio to a six-person deluxe family, with five other options in between. For the caravanners and campers, sites include grass, grass with concrete slab, 20 metre drive through, ensuites and unpowered grass sites. Sites are dog-friendly (at manager’s discretion) plus one fully pet-friendly cabin with kennels available for other cabins. The bungalow is a two-bedroom cabin, featuring a queen bed in the main bedroom one, and a double bed with a single bunk bed on top in the second bedroom. It has reverse cycle air-conditioning/heating, ensuite, fully equipped full size kitchen, full size fridge, kitchen table with chairs, two arm chairs, sofa, slimline television and DVD player. This bungalow is completed with a verandah that comes with table, chairs and pull down shades. This cabin is set away from the other cabins and is close to the pool. Ideal for family or two couples. Please note that by law, children under nine years are not allowed to use the top bunk. Guests, please note that bedding and towels are not supplied for stays in this cabin. Guests must bring their own bed linen and towels. Linen can be provided, however there is a charge applicable. A basic cabin for those wanting value for money. Air-conditioned/heated units have an electric cook top/griller, microwave, television, shower and toilet. Double bed in the main living area, plus two bunk beds. Please note that the second bedroom is small and was designed with children in mind. Please note that by law, children under nine years are not allowed to use the top bunk. Guests, please note that bedding and towels are not supplied in this cabin. Guests must bring their own bed linen and towels. Linen can be provided, however there is a charge applicable. These air-conditioned/heated units have an electric stove with small oven, microwave, crockery, cutlery, utensils, cookware, television, shower and toilet. These clean and cosy cabins are ideal units for the budget conscious. Please note that the bunk bed area is small and was designed with children in mind. It is divided from the rest of the cabin by a privacy curtain. No need to leave the family dog at home while you enjoy a holiday. Your dog is welcome in this cabin. A basic cabin for those wanting value for money with all linen supplied. Air-conditioned/heated units have an electric cooktop/griller, microwave, television, shower and toilet. Double bed in the main living area, plus three bunk beds. Please note that the bunk beds are small and was designed with children in mind, the bunks are not full size and will not suit adults. Please note that by law, children under nine years old are not allowed to use the top bunk. The family cabins have new high volume air conditioners and are heated. Flat screen colour television and fully equipped kitchenette including a cook top/grill, microwave, and fridge. A double bed in an alcove off the main living area and bunks in separate room. Everything you need for an enjoyable stay at an affordable price. This cabin comes with linen and towels provided. All beds are made up. Please note that the second bedroom is small and designed with children in mind. Please note that by law, children under nine years are not allowed to use the top bunk. Ideal for the family with two bedrooms. The main bedroom has a queen bed, and the second bedroom has two sets of bunk beds. All beds have linen and are made up. It offers reverse cycle heater/air-conditioner, full size gas stove top and oven, full size refrigerator, microwave and all cooking utensils. It has an open plan lounge and dining area that has a table with six chairs, two sofas, 32 inch flat screen television with a built in DVD player. The main bedroom comes with a television. Topped off with a large veranda with an outdoor setting, this cabin is ideal for alfresco dining on a balmy night. Please note that by law, children under nine years old are not allowed to use the top bunk. Borderland believe this is the best designed cabin. Modern air conditioned and heated villas, sleeping up to five people. Master bedroom has a queen bed, made up, and with an electric blanket for those cuddly winter nights. The second bedroom has two bunk beds plus one single bed all with linen and made up. Large kitchen/dining area has full size gas stove with oven, large fridge and microwave. Carpeted lounge with two comfortable couches, 42 inch flat screen television and DVD, and space to just relax. Units are handy to children’s playground and a covered barbecue area. The master bedroom also has a television. Great for family or two couples. This is Borderland’s top of the range cabin. Their newest cabin, this stylish open plan unit features two bedrooms, master with queen bed, wardrobe, dressing table, ceiling fan and television. Bedroom two has a double bed with single bunk over top and wardrobe. Please note that by law, children under nine are not allowed to use the top bunk. Full kitchen with gas oven and cook top, microwave, large fridge, all cutlery and crockery. Lounge has two leather sofas, seating five, television, DVD, ceiling fan. Dining area has a seven piece setting. Bathroom has shower, vanity and plenty of cupboards. Separate toilet. Split system for air conditioning and heating. Iron and ironing board. All linen provided with all beds made up. Large verandah with outdoor setting overlooks the pool which is only 10 metres away. An ideal family or two couple cabin. A newly renovated cabin that sleeps four guests comfortably after a long day of driving. Featuring one double bed and two single beds with all linen provided for your convenience. This cabin comes complete with a functional kitchenette that includes a fridge/freezer, hotplates, microwave, kettle and toaster as well as ample bench and cupboard space, handy for longer stays. 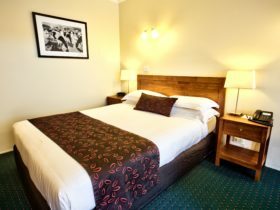 The Hume Haven offers reverse cycle air-conditioning, four-seater dining setting and a 39 inch television that can be seen from all beds. Please note that this cabin does not have a bathroom however it is situated directly across from the amenities building. These are Borderland’s newest cabins, designed for the budget conscious, but with style and flair and everything you need. 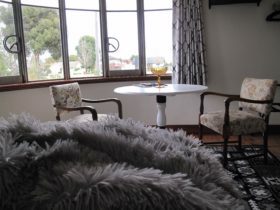 They are one bedroom and best suited to single travellers, but will accommodate a couple. Double bed, ensuite, kitchenette, table/chairs, fridge, microwave, wall mounted television, reverse cycle air conditioning/heating and ceiling fan. Outside is a lovely verandah deck with table and chairs. Full linen supplied and bed is made. 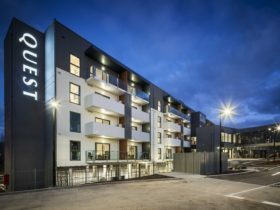 Comfortable, one bedroom units, ideal for couples. Two way bathroom. Cabin has heating and new high volume air conditioning. Kitchen with a cook top/grill and microwave plus all utensils, crockery, cutlery. Kitchen has table and chairs. Lounge area has two comfortable armchairs and reading lamp. Unit comes with all bed linen, towels, doonas, and electric blanket for those cuddly winter nights. Enjoy the convenience of your personal ensuite at your site. Some Ensuite Sites have annex pads, some have afternoon shade and some are for the sun seekers. The choice is yours. Please specify your requirements when you book. 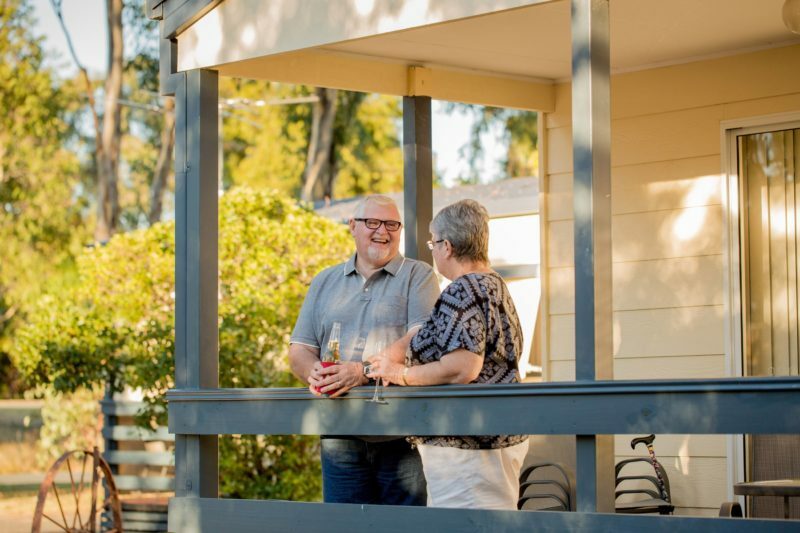 The onsite caravans provide a budget-friendly option for guests. It has a double bed with small kitchenette and dining area. 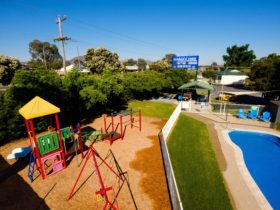 The caravan is close to shared bathroom facilities, camp kitchen and recreation room. You will need to bring your own bedding (sheets, blankets, pillows and towels), or this can be supplied at a cost. Dogs are not allowed. Borderland’s 10 extra large 20 metre (60 feet) stay hitched drive through powered sites are ideal for holiday makers, tourers with large caravans, motorhomes and fifth-wheelers. Close to amenities, laundry, camp kitchen/television room, and barbecue area. Drive through sites are level asphalt based all weather sites There are also have five grass drive through sites You can stay hitched up or unhitch. Easy drive in / drive out sites. 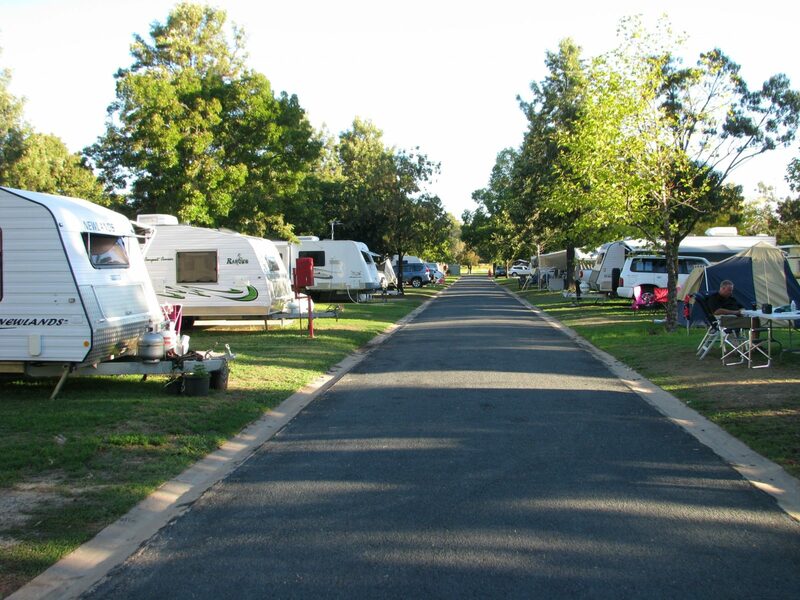 BIG4 Borderland Holiday Park has a wide range of sites on offer to suit all caravans, campervans, motorhomes and tents. Select from a variety of powered of sites, on grass or concrete slab, all with car space. 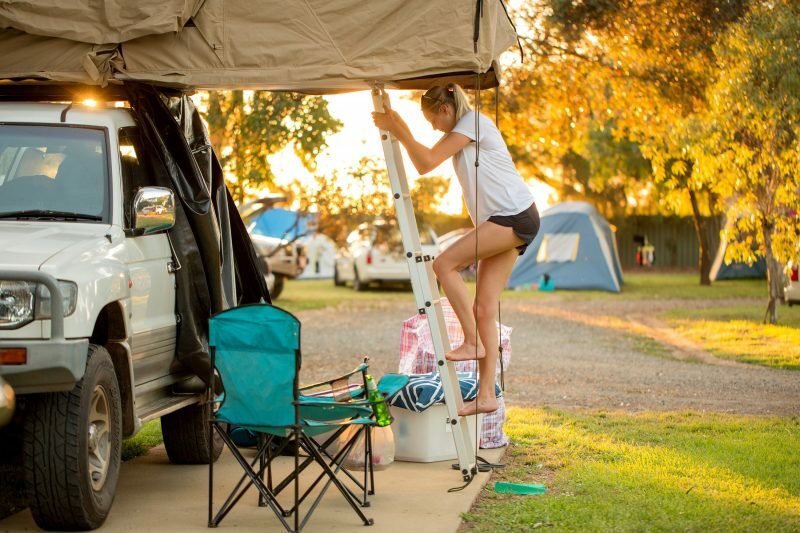 Sites are handy to amenities and laundry, swimming pool, spacious camp kitchen, television room and barbecue area. These sites have power, water and sullage, but do not have a concrete pad. They are ideal for tents, camper trailers and swags. Amount of grass is seasonal. Unpowered grass sites are ideal for tents, camper trailers and swags. Amount of grass is seasonal. Standard Cabin for two people in low season – bring your own bedding for $79. Villa for two people with bedding included for $125.